The Founder and the Managing Director of the Law Firm is Vasiliki C. Anyfanti, a lawyer with 10 years of legal experience. 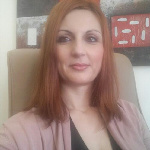 Born in Larisa, Greece on 1981, Mrs. Anyfanti has been educated and trained, in Greece. She has worked in Greece, She was born in Greece and speaks English, Greek and German. As an international Estates lawyer, he specializes in Criminal Law, Estate Planning and Administration, as well as real estate property transactions in Greece. Mrs. Vasiliki Anyfanti is member of the Athens Bar Association.